Coolest Roulette Birthday Cake – 5 Feet Long! 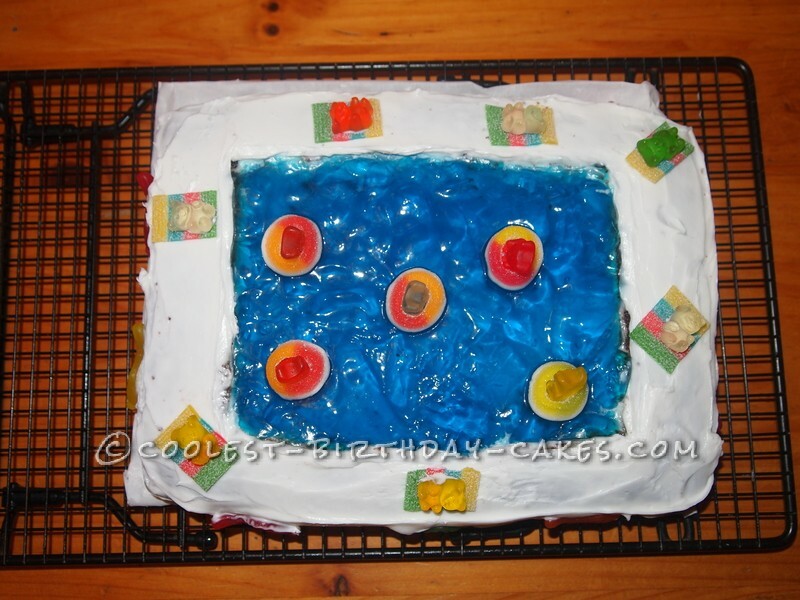 My daughter was having a pool party, which was my inspiration for this cool Swimming Pool cake. I made a large chocolate sheet cake and, when cooled, cut a shallow rectangle out from the center for the swimming pool. Don’t cut too deep. Used the reserved cake for snacking. I lightly frosted the inside of the pool to prep for the addition of the “water”. I made 2 packages of blue Jell-O as per instructions, and let it set slightly but not completely. Once thickened, I poured the Jell-O in the center of the cake. Refrigerate until firm, at least 4 hours. I used white butter cream frosting for the cake, sliced fruit roll-ups for the beach towels, gummy bears as sunbathers, and Life Saver gummies for the life preservers. Decorate the sides with fish, or anything to do with water, swimming, etc. Easy to make, fun for the kids to decorate, and the kids thought it was so cool!